If you’ve been following Aliventures for a while, you’ll know that my husband and I have a baby daughter. She’s two months old now and, over the past weeks, I’ve come to realise that although parenting is an exciting new adventure, it’s not so very different from my life as a writer. If you’re a novelist or a parent (or both!) then I suspect you’ll recognise a few of these. And if you’ve got novel-writing-and-parenting experiences to add, just pop a comment at the end of the post. Your novel might take years of work: researching, writing, rewriting, editing, searching for a publisher (or self-publishing). That initial moment of inspiration is easy; the rest isn’t. If you’ve never written a novel before, there’s no way to be fully prepared for what you’re letting yourself in for. Becoming a parent is a massive commitment: pregnancy and preparation and birth, then a baby, toddler, child, teenager. The moment of conception is easy; the rest isn’t. If you’ve never had a kid before, there’s no way to be fully prepared for what you’re letting yourself for. Tip: Take it one day at a time – and every so often, look back to celebrate how far you’ve already come. If you’re a parent … well, the guilt trip starts with that glass of wine you had before taking the pregnancy test, and I suspect it never really ends. Tip: Try not to wallow in guilt. Your finished novel – or grown-up kid – is very unlikely to suffer from one or two mistakes along the way. Tip: You can never have too many bookshelves, or too many big plastic boxes. Your Facebook page is a series of updates about your word count. Every conversation you have inevitably ends up being about your novel. You constantly spot interesting people in the street, and wonder whether they’d make great cameo characters. Your Facebook page is a series of photos of your cuter-than-cute kid. Every conversation you have inevitably ends up being about nappies and sleepless nights. You constantly spot awesome-looking buggies in the street, and wonder whether they’re better than your travel system. Tip: Hang out with fellow novelists / fellow parents; you’ll be less likely to bore them. Tip: If you’re a parent and a novelist, multi-task: combine middle-of-the-night feeds with musing about your novel-in-progress. You’re worried that your dialogue is stilted, your descriptions are trite, and your plot is riddled with holes. Your novel is never going to be publishable, and even if you get it out there to the world, it’s never going to be read. You’re worried that your kid should be eating less, sleeping more, and doing that cute thing that your friend’s kid can do. They definitely shouldn’t be headbutting you in the mouth then laughing. Are you raising a baby psychopath here? Tip: Find a group of writers / parents, and get help and encouragement from those who’ve gone down this path before. One book tells you to plot out your novel in detail – with paragraphs of description for each chapter. Another book tells you to just start writing and let inspiration guide you. One agent says begin in the middle of a scene. Another says they never take novels that start with a line of dialogue. One book tells you to carry your baby everywhere, all the time. Another book tells you that your baby should only ever sleep in their cot. One expert recommends controlled crying. Another says that you should never, ever leave your child to cry. Tip: There’s often a happy middle ground. You’ve read ten books about novel-writing … but now you’re actually doing it, a lot of that theory doesn’t seem to be helping as much as you thought it would. When you’re in the middle of writing a scene, how can you possibly remember everything you read about crafting descriptions and showing character and writing snappy dialogue? You’ve read ten books about parenting … but now you’re actually doing it, you’re lucky if you can remember to brush your teeth, let alone keep track of that complicated schedule your baby is “supposed” to be on. Tip: We live in the real world, with all its complexities and compromises. Consult the books when you’re stuck or confused, but don’t try to follow them slavishly. #9 You know best. Better than the people advising you, because this is YOUR book or baby. I had my daughter twenty-three years ago, and it’s interesting that some of the advice I was given at the clinic is now totally out of fashion – including being told to put her to sleep on her front (I never did, as she looked so uncomfortable with her little head screwed round to the side). Congratulations to you and your husband. Daughters are worth all the work, I am in a position to tell you. Great ninth tip, thanks so much, Lexi! It seems like the advice changes every few years … and I’m sure that when Kitty has children (gosh, that seems a very long way away), it will all be different again. This is wicked, Wicked, WICKED helpful! 🙂 I’m an empty nester now but it feels like yesterday when I had kids and you are so right about one day at a time and how you can never be prepared. You have to take a flying leap off a cliff and hope you land in one piece. I remember when I consciously made that decision to take the leap and now I’ve just done the same with beginning to write an historical novel. Your insight is right on and so timely for me right now. Thank you! Your picture with your baby is adorable. I thought I feel in love hard with my husband and even that didn’t prepare me for how over-the-top in love I was with my kids. You never stop being a mom, thankfully. 🙂 Happy belated Mother’s Day! I’m a father of 17. Ten of them are books, seven of them are human beings (more or less.) Your list is spot on. Here’s the thing I knew about writing 45 years ago which I DIDN’T know about being a parent until my first kids were older: they will be the source of your greatest joys, and your deepest heartaches, and you would do it all over again because the joys infinitely outweigh the pains. Oh my goodness, Joel, that’s a lot of book and human babies … congratulations on them all! And thanks for contributing your wisdom here — I’m sure there’ll be times (probably when Kitty’s a teenager, and when I’m redrafting my current novel-in-progress for the fourth time) that I need to remember all the joys that make it worth it! Congratulations Ms. Luke! Your daughter is so sweet. If one is writing a novel, which is fiction, how important do you think is the research? After all research is mostly about non-fiction. I mean how much real world descriptions (of places, environments, etc.) should go in a novel and how much should the writer make stuff up? Where do you draw the line? Great question, Farhan. I think it really depends on the genre you’re writing: for instance, if you’re writing a crime novel, your readers might expect you to get certain facts right (like types of gun). Some writers set their novels in real locations — if you’re writing a novel set in London, for instance, you’ll obviously want to include real street names and landmarks. Other writers prefer to make up locations or leave them unstated. Personally, I don’t like research and do as little as I can get away with … though I should probably do more! For me, what matters is that the story is believable and that readers aren’t distracted from your story because your facts are wrong or your descriptions jar with their experience of real-life places. Your reply is helpful but I’d love to read more about this topic so do you know of any article or book to which I can refer? Silver Huang’s last blog post ..David Bowie And The Next Day. Lessons In Creating Real Art. As a father of four, I can say your list is spot on! Continued best wishes for your family – and for your novel-writing career. Thanks Alex! I have so much respect for you and the other parents I know, now (especially those with several children) — I never realised before just how much work it is! Right now, I’m just commenting for the photo. SO. MUCH. ADORABLENESS. IT’S SO CUTE. YOU’RE BOTH STICKING OUT YOUR TONGUES! (hopefully not blowing rasberries). But omigosh, I just have to comment on the absolute cuteness radiating off that photo. -Need to be disciplined about both things. For writing, you need a set schedule isntead of having a spur of the moment writing. For parenting, you need an established way of behaving to show kids how you want them to act. -Need to walk the talk. For parenting, this means you mean what you say and say what you mean. For writers, this rule is more…loose? Since it’s best if you have the experience you’re writing about, it’s best to do whatever you’re writing about as far as possible. But if not, then do a ton of research. -There are times when you need to turn off your inner critic. For writers, this means editor. For parents (or siblings), you can consult others, but need to quit talking about how bad they’re doing. -When people offer advice, take it. For writers, this means betas. For parents, this means other parent’s suggestions or even a remark made from their kid. 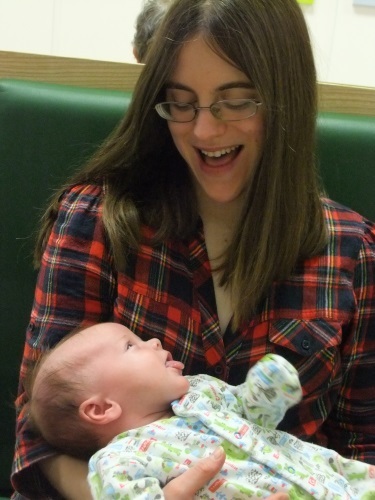 Ah, there are lots of considerably less cute photos of us… 😉 Paul managed to snap a good one there, though! Brilliant additions — thank you! I definitely agree with being disciplined — if anything, I think this helps with creativity and being spontaneous, because you’re not too disorganised to take advantage of sudden moments of inspiration. I’ve come across so much good advice about both parenting and writing — though I’d also say, try out the advice you get, and if it doesn’t seem to work for your novel / your kids, don’t be afraid to ditch it and try something different instead. Congratulations! Such a beautiful baby Kitty is, and I love her name. “Kitty Luke,” sounds like a novelist in the making. ps: Glad to have you back. You’ve been missed! Thanks, Gerty! And of course I secretly hope Kitty will grow up to love writing as much as I do … though she’ll probably surprise Paul and me by wanting to do something totally different from her parents! Hi, Ali! Congratulations on your baby! I’m on my personal blog this morning, and one of the hits in my stats tracker was the post in which I wrote about your post, “Take a Break From Your Adventures (and Enjoy Life More)” back in 2010. I’m happy that it brought me back here, to see that you’re a new Mom. My tip: Stay connected to your spouse, no matter what. Parenting, just like writing and editing, can completely consume your days and nights for long spells. It may not seem possible, while you and your husband bask in the joy of your new baby, but as time goes on, you can realize that it’s literally been MONTHS since you had some quality “adult time” together. When you have more than one child, this can happen more easily than you would ever imagine, and the combination of parenting and work can make this even more difficult to prevent. The best thing you can do for your life is keep your marriage strong. It’s a lot easier to “fix” a neglected writing project than a neglected relationship. I think your tip is a crucial one — Paul and I have been consciously making time for one another (we’re lucky to have my parents living very nearby, and my mum babysits some Friday nights so we can enjoy dinner and a couple of glasses of wine in peace!) I’m sure this must be a huge challenge for anyone with more than one child, though … we’d like another in the not-too-distant future, so fingers crossed that things will all go smoothly when we get to that point. Good for you! Parents and friends can be enormously helpful in this effort (as you have discovered). We are fortunate to live near our grown children’s families, and now and then Papa and Nana (my wife and myself) get to have the evening with the grandkids. It’s fantastic that you and your husband have a “date night” so that it’s in the calendar, and takes priority when other things come up. Rock on, and thanks for the reply. I think one addition I’d like to make is “Enjoy the process and the journey. Learn from every experience and Move on” – Be it in parenting or writing.. Both parenting / writing are somewhat very private ; and yet very public that many times its so easy to get caught up in the little things. And you can forgot to enjoy the journey. 10 years from now (as a mother / writer) – What really matters is the memory bank you create, and the little milestones which make the journey worthwhile! Children and art both grow and change in the perceptions of everyone they meet. While you might think of your child/novel/&c. as being primarily the product of your values, once they leave your control they will become their own subject with their own life-path. Tip: Accept that other people will see a different message from the one you intended, or even see a deep meaning in a throwaway line, before you change from being a creator to a prophet of the one truth. Dave, that’s a super addition to a super string of comments here. I spent the last two weeks with a friend who, like me, is a songwriter, and he taught me that lesson: create your art, and let others find themselves in it. Considering that I’M the one who taught HIM songwriting basics, it was a glorious lesson to learn from a beginner. Delightful to see it repeated here, in part because when you relate it to parenting the point becomes, to me, self-evident. Dave Higgins’s last blog post ..Furniture Crisis? Worry No More! The hardest part is letting go. Watching your baby grow up, developing its own voice and character and getting noticed and loved by others – Writing novels is just like raising a child. The difference is that writers can keep hold of their “baby” and not let it grow and aspire and change lives. The difference is that we can hold onto our novels (or any writing) to stop the moment coming when we have to say: “Over to you. Go forth. Be brilliant.”, and let its promise gather dust. Thanks, Tom! Great point on letting go — it can be very hard to decide enough is enough, but no manuscript gets read when it’s sitting in its author’s drawer (or on their hard-drive). “#5: You’ll Lie Awake in the Middle of the Night” so true!!! Excellent article! Thank you!